Xulon Press was founded by author and publisher Tom Freiling in 1999, and the company is part of the large media and communications group, Salem Communications Corporation, based in the USA. Salem is a Christian communications media group with commercial interests in radio, the Internet, and magazine publishing, and not surprisingly, Xulon Press claims to be the ‘leading Christian publisher in the United States – title for title’. Xulon Press present a very corporate image and I have to say operate one of the best publisher websites that I have seen (commercial publishers included). The website is packed with self-publishing information, FAQ’s, news, blog pages and author pages. In fact, much of the Xulon Press website is geared entirely toward authors and the Christian community as a whole rather than the offensive ‘in your face’ hard-sell marketing push of self-publishing services. It is very much corporately slick, but not a low end sleazy corporate slick. There is nothing hidden away here like the elephant in the corner of the room, practiced by so many other author solutions services. Immediate links to royalties, guidelines and book pricing hits you square in the eyes on the top menu of the main web page. This is a large global self-publishing services operation and the company chooses not to engage in the bluff or dreamboat marketing many companies offering author solutions services companies of this size engage in. The answer is six! The question of course was ‘how many times does the word Christian appear in the above paragraph?’ We get the message. We do get the availability in ’25,000’ bookstores’ line common to author solutions services—read available and not that an author will have their books stocked in stores. This is one of the many misleading statements propagated by author solutions services. However, we will let this go; just let’s hope this doesn’t all go pear-shaped after such a good start from Xulon Press. We will look at the 100% claim on royalties paid to authors shortly. Are Xulon Press doing another ‘Mill City Press’ on royalties? Xulon Press are actually better on royalties than many others, but again, the statements from the company are still slightly misleading. We’ll see. From the online guidelines, it is clear authors can send or upload a word format file which Xulon say will be formated with all paid packages. If authors intend to load PDF files (print ready), then they would be advised to make themselves familiar with Xulon’s guidelines for completed book layout and page formatting before submitting through their ‘Author Centre’ facility. Images (max 50), photo images and rear cover book description are also submitted separately at this stage. Clearly Xulon Press – at least at this stage of the process – have a limited series of format options and seem quite particular about using Times Roman Numeral as a default font. These are the basic core elements provided by Xulon in their publishing packages. Xulon offer three publishing packages, Premium $1299, Best-Seller $2299 and Elite at $7754 (at the time of this updated review, Xulon had the Best-seller and Elite packages on a time-limited sale of $1699 and $4099 respectively. Thankfully Xulon Press has dispensed with the Gold package, which did not include distribution, and at the $799 price mark, was way overpriced for what is actually delivered. This package is a significant saving grace. My faith in humanity is restored. I am going to honestly say that I considered calling it a day for Xulon Press when the company previously offered the Gold package. Xulon Press would not have been the first author solutions service where I invested many hours of research, only to discover I was dealing with a duck’s egg parading as the golden nugget. Well, Xulon Press, you ran this one really close to the wire! Fortunately, the company saw the light of day and perhaps my first review in 2009 pushed them in the right direction. The Premium service is the cavalry on the horizon. Proper POD listing and availability, a real sales distribution service (rare in POD Publishing), the 100% royalty, the immediate toll-free order service if you are on a book tour, the Amazon Affiliate programs and multiple specialised Christian store catalogue listings, all mean Xulon Press push to the head of the pack. There is a God! This package is where I believe Xulon’s connections in media is really brought to bear on the author’s behalf. The Xulon media connection alert and Christian bookstore catalogue listings carry very serious weight. In any direct community marketing – this kind of direct marketing identification really does make a difference to getting the word out about an author’s book. You will forgive me if I use a worn cliché – this is preaching to the converted – already a captured audience for Xulon Press. Authors also have the option to load print ready files, (the guidelines are here). The concern I have here is that Xulon expect to charge the same fee even though the author has done most of the work! Now, about that 100% royalty question. Yes, Xulon do a ‘Mill City Press’. It is a 100% royalty to the author, but only after print costs and Xulon’s mark-up on books are taken into consideration. 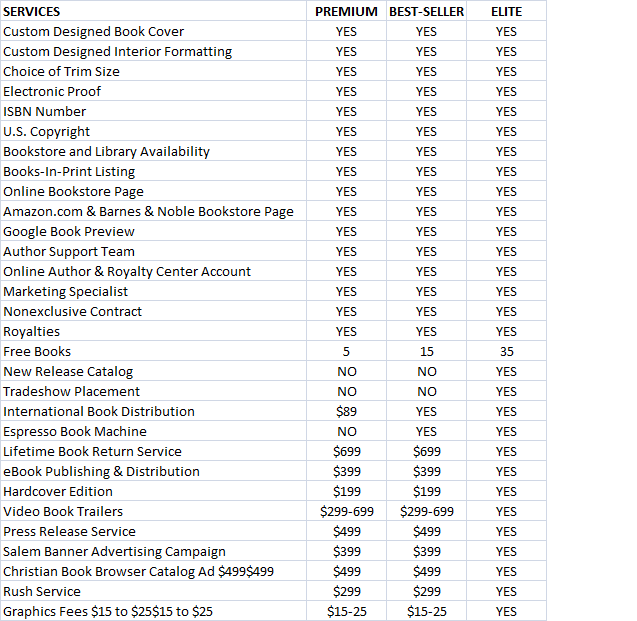 Still, the author profits more than many other author solutions services – probably closer to 60 – 70%. Xulon provide a number of other services which are all competitive. See their site for details. This was a tough one to call, probably the hardest review to date. Overall, Xulon Press is not an author solutions service I would recommend if you are looking in the bargain basement of services with a few hundred dollars to spend, or you have design skills and the ability to produce your own print ready book files. Xulon has a specialised area of sales-targeting – and more to the point – has the where-with-all and services to do it using the top two packages. In most of my reviews, I find the basic or standard packages are the best. Xulon is a rare and welcome exception. Even at the $4099 end, you are getting more than most POD author solutions services claim to provide and deliver to the author. Don’t be overly put off by the Christian book tag. My own book out for submission with commercial publishers would easily fit Xulon and I am sure many more authors’ books would. I still have peeves about Xulon; the print mark-ups on books is above other good author solutions services, allowing authors to submit print ready files and charging them the same fee for the publishing packages. But what Xulon Press do well, is executed exceptionally well, in particular the marketing and promotional services, and for that and what is on offer, Xulon hit the gold star. Greetings and thank you so much for your insightful review of Xulon. I am working on a project that includes eight Leader’s work books, eight Student’s Manual, and a Leader Training Manual. I am ready to start publishing them and trying to my homework before committing to a publisher. Any input you may have would be greatly appreciated. Xulon looks pretty good I am still trying to get a little more educated before committing. Yes, Xulon may be a good fit for your project(s). Am I to understand that there are more than one book intended for publication or have I misread you? If it is as I suspect, more than one book, than consider yourself in a strong position with Xulon or any other POD publisher. I would suggest speaking directly to a Xulon publishing consultant through one of their advertised phone lines on their webpage. 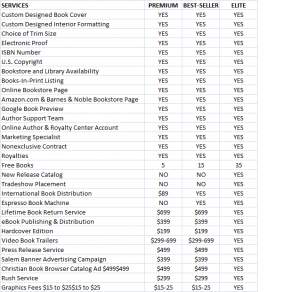 If we are talking about one or more books than I would look to cut some sort of overall deal for the project which gets you publishing packages below what is the listed service charge. Go in with the approach that they need your ‘custom’ more than you need their services. Xulon are very strong on media/podcast services – discuss these. Above all, consider getting this project edited professionally before submitting the work to Xulon. You will probably find this cheaper from a skilled external editor who does freelance work. Try googling freelance editors in your area. I published with Xulon in April. I would not recommend Xulon to any author because as of this date they have NOT PAID ANY ROYALTIES! Their website says that royalties are paid quarterly, but that was changed this year to twice a year, July and January. I would strongly suggest taking your business elsewhere. So is it still like that to this date and have you received anything as if today.. This is not entirely uncommon with author solutions services but I would advise any author before thinking the worst to be sure, firstly, their books have actually had sales through the distribution network. Second, some author solutions services do not pay royalties on copies sold directly to an author at a discount. If this is not the case, then you certainly should contact the company rather than wait till the next royalty payment time comes around. I am actually a Xulon Press employee and I want to point out one thing. We format our authors books and need for them to follow the manuscript guidelines. The PDF guidelines are there only if the author has more than 50 graphics (our limit for graphics) or wants to format their book themselves. We do not over a service where the author could sit down with us and show us exactly what they want so this gives them that option. Yes, it is the same price because we only sell a complete program. Thanks Anonymous (09/12/09) for your clarifications. I have now amended that particular part of the review re file submissions. However, on the PDF file submission – I think the whole point is that the author does not actually want to ‘sit down and discuss’ but simply submit a print ready file. On that basis, the limitations of packages overly penalizes an author who has carried out much of the format prep work themselves. Believe me, I’ve talked to authors, and with so many going with places like Lulu, CreateSpace – a ‘bones and no flesh’ service is something many POD publishers find very appealing to some authors. Something worth considering and taking back to base camp. Well, the UK Pound has always been far stronger than the Us dollar right back to the seventies, but where epublishers challenge print publishers is in reach. Beyond DRM, ebooks are global, and pricing can be consistent across territories. The key for you is not where you are or where your authors are, but understanding your client/authors’s needs and delivering upon that. The landscape of publishing is going to continue to change and the publishers who will survive will be the ones best equipped to adapt quickly. So…with all of this being said….and I understand that this blog is over a year old….where does a new writer go? Any recommendations? So…with all of this being said…and understanding that this review is over a year old…where does a new writer go? Ive contacted Zulon and two other publishing houses and quite frankly, I am at a loss. Not much has changed at Xulon over the past year, though I do try to keep all the reviews up to date as possible. I avoid making direct public recommendations of self-publishing providers because every author has his/her own unique position and desires for their books. I tend to advise authors to first focus on what their requirements are before choosing a provider. The landscape of publishing is constantly shifting month on month. More and more new authors are starting out with epublishing rather than issuing a paper edition, and I think that is a wise approach. Yous should find this post particularly helpful when looking at self-publishing providers to avoid the pitfalls. Christian Christmas stories and have shared them with friends and few congregations. I have been told I should get them published. However, when I mention I have more than one. I am asked to combine them. I hope this does not come across wrong. But sense there are so many secular stories on the market. I felt I wanted to keep them short and seprate. Any input about this and who would better fit me would be appreciated. I have also written children’s EASTER books. I forgot to mention all my stories rhythm. I did this hoping to keep the attention of the audience. Thanks I know this blog has sat for awhile but it caught my eye as I was searching.